Optimized primary fluid pressure drops thanks to the use of various tube diameters. Possibility of an optimized product selection by using different module lengths. 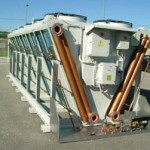 The “Power line” Dry Coolers are thus a very innovative product capable of fully satisfying the requirements of anyone operating in the industrial cooling sector. 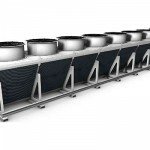 In this range of air coolers one can has a choice of using fans of 4 different diameters: 500, 630, 800 and 900 mm; the number varies from 1 to 16 fans, in a single or double row for capacities of between 8.5 kW and 1,120 kW at normal standard conditions(ENV 1048 standard). 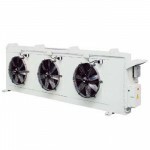 Double speed external use fans are used (400V/3ph/50Hz), to achieve up to 8 sound levels for each diameter. The casing is made of zinc coated steel, stove enamelled with polyurethane resins (RAL 7035 standard) to ensure the equipment’s utmost solidity and robustness. Fins in various materials (aluminium, copper and aluminium, pre-coated and double coated). Special motors: single phase for 500 and 630 mm diameters, 60Hz net frequency, various voltages and for high ambient temperatures. 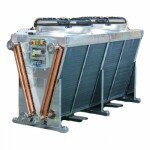 “Power J” is a series of innovative double coil air coolers capable of fully satisfying the requirements of industrial refrigeration and air-conditioning operators. The capacities of the new Power-J series range from 76 kW to 1,585 kW at normal conditions (ENV 1048 Standard). 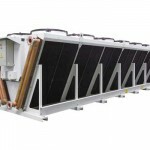 The extraordinary performance of these dry coolers is the result of an optimal combination of new high efficiency aluminium fins with copper tubes and newly designed fans which can develop high air flow with reduced current absorption and low sound emissions. The Power-J series is based on a modular design with a RAL 7035 stove enamelled galvanized steel casing and can assemble up to sixteen 900 mm fans with 8 sound power levels, in a single or double row. 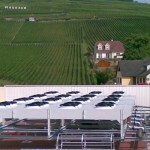 Special materials for all types of uses or installation environment. Very low energy consumption electronic motors. 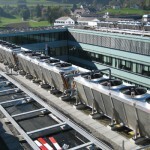 An innovative “adiabatic” AFS (Air Fresh System) system is also available on request: this automatic cooling system enables the cooler to keep up the same level of performance even when the environmental air temperature is higher than design conditions. Getting advice on the type of materials, the sizes and the most appropriate combination for your requirements. 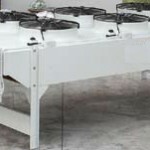 Be sure of the highest level of accuracy in calculations and sizing of the coolers. 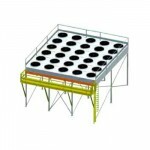 The possibility of having the ATEX standard solution for our entire range of air coolers. If you are interested in our air cooler models you can get in touch with us using the form contact us or by calling 348 6925260.